Ant Man first appeared in the 1962 Tales to Astonish which was created by Stan Lee, Larry Lieber and Jack Kirby. Dr. Hank Pym was the first Ant Man who along with his girlfriend Janet van Dyne were among the founding members of the Avengers. That history is briefly touched on in this new cinematic recreation of the super character directed by Kevin Feige and written by Edgar Wright, Joe Cornish, Adam McKay and Paul Rudd. Wright was supposed to direct back in 2006, but cited creative differences and still maintains credit for the story. There were two others that donned the Ant suit costume in the Marvel comics, but only one is followed here, and the story is a bit different. But seeing that unless you are a die hard Marvel fan, those story differences would be neither here nor there. It's just a fun film worthy of the Marvel franchise. 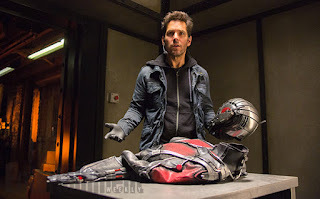 Who would have considered Paul Rudd as the Ant Man? 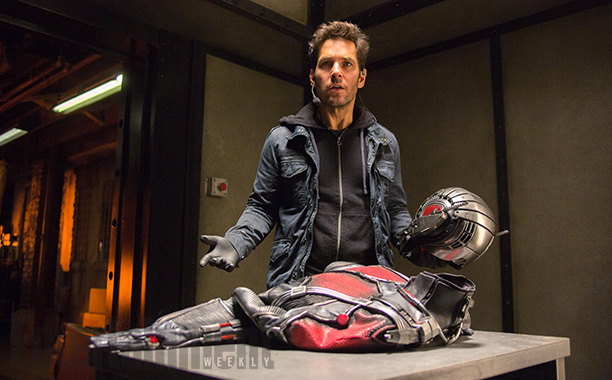 But he really works in this role as ex-con Scott Lang. Scott was imprisoned for a burglary that was considered impossible to pull off. Now he's out of prison, he can't get a job even having a masters in electronic engineering. His ex wife Maggie (Judy Greer) would like him to spend more time with their daughter Cassie (Abby Ryder Fortson) but he needs a steady job and an apartment. Maggie's new boyfriend Paxton (Bobby Cannavale) is a cop and doesn't trust that Scott will not return to a life of crime. His criminal friends, ex cellmate Luis (Michael Peña), Dave (Tip T.I. Harris) and Kurt (David Dastmalchian) tell him about a job that involves a safe. To get money quick, Scott agrees but ends up with only what he thinks is a motorcycle outfit. When he puts it on, he discovers a whole new world. Dr. Pym (Michael Douglas) has been watching Scott for a long time being impressed by his ability to do such impressive crime. He trains Scott after convincing him to use his skills to burglarize his old company Pym Technologies that was taken over by his former protégé Darren Cross (Corey Stoll). Pym had not given the secret to his formula for Pym Particles which allows the user to alter their size. Hope (Evangeline Lilly), Pym's daughter works with Cross, keeping an eye on the progress of the Yellowjacket project, a badass miniature battle suit. She also has issues with her father for death of her mother. She doesn't think that Scott has what it takes to wear the Ant Man suit and sabotage Cross Industries. It's hard to imagine ants as being helpful and fun, but after watching this, you may change your minds. Pym has created a tech that allows the user to communicate with the different species of ants that will be used in their mission. The action is fun and clever as Scott trains with the bugs and even has encounter with one of the Avengers. The first part of the movie is somewhat awkward and meandering setting up characters, but half way through it picks up speed and the rock and sock em scenes are balanced by some funny jokes (especially Michael Peña). The movie tries to be about fathers disappointing their kids then finding redemption to give it some heart. It doesn't bog you down with the science of atomic relative displacement. Marvel does have some issues with their lack of focus on women characters, but the last scene after the credits...so do wait...will give Hope for future films.